I’ve started a bunch of blog posts and just never finished them. They’re collecting dust in my drafts and I’m not sure they’re worth publishing. Its cause I was feeling rather blah when I wrote them and although that feeling hasn’t left yet, its getting better. -Sooo, whats new? Well, I finished the cat lady quilt. Its more like a throw blanket, or lap quilt. Its perfect for sitting with on the couch. I know this because the quilt and I just sat down and watched the Project Runway finale together, and it was delightfully warm. -Speaking of watching shows on the couch, today was the first day I could sit on the couch rather than at my desk in an uncomfortable chair. Yesterday I was looking at how to use Youtube on the PS3 and then it linked me to a tutorial to set up file sharing on my mac to the PS3. My day was made! I’ve been dying to set something like this up and just didn’t know how it was done. YAY! -I started working on the backing for the blue star quilt. I have a pretty blue sheet thats just a tad too small, so I’m adding a boarder and then I’ll spray baste it and work on hand quilting. I still need to find a good backing for the pink and grey chevron quilt. I may just go with white and be done with it because I want it done for Christmas. We’ll see though. -The other day we were dropping Sadie off at preschool. She gave Lucas and I each a hug like she always does, but then her little friend came up to her afterwards and said “Can I get a hug too?” Most adorable moment ever. They hugged and then bounced on into the classroom. -Been listening to the Sawbones podcasts. “A marital tour of misguided medicine” is how its best described. A husband and his wife (who’s a doctor) go through and discuss the history behind different treatments of diseases, practices and so on. They’re hilarious, and I find the history fascinating. Being squeamish about medical stuff, I still love it. Anyways, go have a listen. -Looking forward to a childless weekend the day after halloween. This so pleases me. Its like a tiny vacation for me and I look forward to it. I foresee a sushi date and some thrift shopping happening. Ohhh and just now a tiny yellow crowned sparrow crashed into my big glass door. I’ve never witnessed the crash, usually just see them stunned on the ground. He looks ok-ish. He was just trying to flap his wings, but I think for now he’s just recovering on my deck. Thankfully he’s breathing and moving a little. 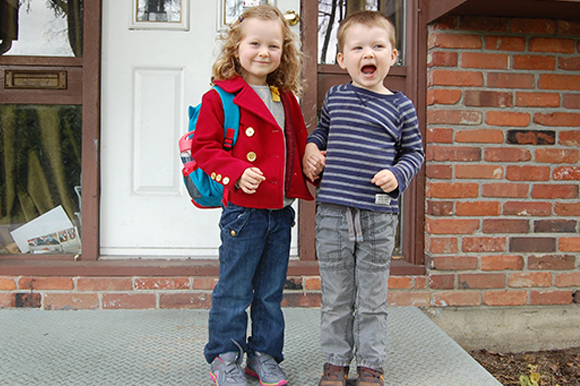 She insisted that her brother accompany her in her first day of preschool picture. They were both really excited. Her first day was october 1st, and so its been a week since she started. The first day we went was only for an hour. Lucas was confused as to why he wasn’t allowed to stay with her, and so I treated him to the playground at the school for that entire hour. He was an exhausted child that day. Her second day was the full 2 hours, and so I wasn’t going to stay and play. Lucas was devastated, and he cried the whole 10 minute walk home. Since the weather has been beautiful, we’ve stayed to play at the playground after she gets out. The elementary school that our preschool is in gets out 10 minutes later than preschool, so we have time to play before the big kids are done. Now that its been a week, Lucas is getting used to having time at home with me by himself. Today was the first day he really got used to it and enjoyed it instead of asking about Sadie. We read all our Pete the Cat books and cleaned his room a little. When Sadie is done, she runs out of the room and always gives us the biggest hugs. She’s had no problems adjusting, but she’s such a lovey girl. Hopefully preschool continues. We hope to get our subsidy forms in tomorrow and then we’ll see what kind of assistance we can get for her.